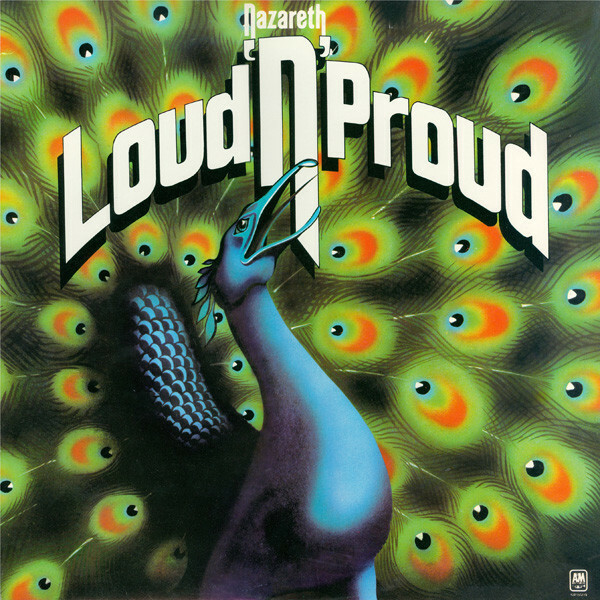 For this weeks highlight we are going way back to the year 1973 with the fourth album from Scottish hard rock band Nazareth entitled “Loud n Proud”. Nazareth have been one of those 70s bands that always eluded me until about three months ago when I decided to pick up a copy of their “Anthology” CD at a discount store. After listening to both discs multiple times, I had become almost obsessed with the band. The thing that makes their music so interesting is the fact that they have a heavy edge to them but they have a lot of more melodic up beat pop songs that are just as good and how every album had something to enjoy. But enough rambling, let us taker a look at one of my favorite albums they released in the 70s. The album opens very bombastically with the bumping rocker “Go Down Fighting” featuring some awesome slide guitar work from Manny Charlton and some of Dan MCcafferty’s best vocals on any Nazareth album. Out of all their albums, this one is definitely one of the most consistent at least in terms of harder rocking songs with another being the infectious cover of “Teenage Nervous Breakdown” and “Not Faking It” being one of my all time favorites from the band. “Turn On Your Receiver” is another great one with a very boogie rock feel to it and Dan’s vocals balancing the raspy and melodic feeling perfectly. The song “Child in the Sun” is the ballad of the album but is still a great melodic 70’s rock song that Nazareth delivers perfectly. The heaviest moment of this album is the epic closer “The Ballad of Hollis Brown” which was originally written by Bob Dylan. Thus is definitely the most interesting song on the album in that compared to Dylans version, it is miles different with the song being dominated by some of the heaviest fuzzed out droning bass that anyone at the time had ever been doing. The song overall has a very proto-doom feel to it and in a way is heavier than anything Sabbath did up until this point. Combining the bass with MCcafferty’s wailing and dread filled sounding vocals really makes for a chilling atmospheric song. Overall, if you want a Heavy and melodic solidly written 70’s Hard Rock album, this one is one you need to check out. The band have a lot of great albums similar to this one such as “Razamanaz”, “Expect No Mercy” and others but I feel they peaked with the heavy rock sound on this album.